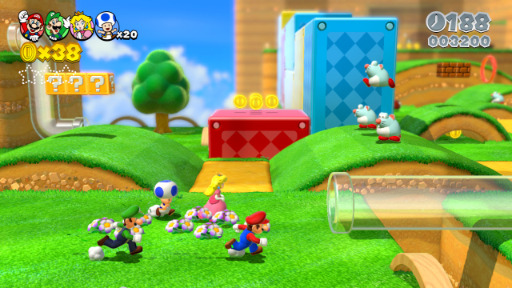 Super Mario 3D World wants to be a game that can be played by people of vastly differing skill levels. Typically in games this is done by adding difficulty levels but Super Mario 3D World couldn't do that because it didn't just want everyone to be able to play it on their own, it wanted everyone to be able to play it together. With everyone playing it together we can't give one player the hard version of the level and the other an easy version, they are traversing it together. Imagine 2 people playing this game together. Player 1 is very good at this game while Player 2 isn't very good. How do we make this game fun and playable for both P1 & P2 at the same time? Yes, playing the game with friends is inherently fun, but so is everything else so why play this game in particular? 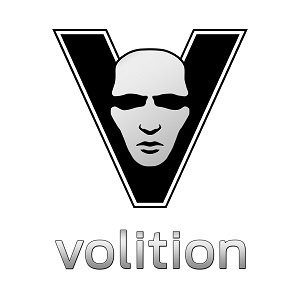 What does this game bring to the experience? Making the game fun and challenging yet beatable for P2 is fairly straight forward, you just give them P1's progress. P2 falls in a pit but P1 is just fine so a couple of seconds later you just re-spawn P2 near P1. This means that they get to try every challenge but they never get stuck on any of them provided P1 can beat it. They also get to feel helpful as often player P1 will die from negligence or from over aggression and P2 gets to be the hero just by living or possibly doing what P1 couldn't. Even though we are giving P2 P1's progress we still can't balance the game around the skill level of P1. If the game is to far above P2's skill level then they won't get to feel like they are playing the game or adding anything. If some parts are to hard and they must rely on P1 that is fine, but that reliance must not be a constant thing else P2 will get frustrated because at that point they might as well just watch P1 play the game. Making the game interesting for P1 though -when they are significantly better then what the game demands of them- is more complicated. We want to make it interesting for P1 but we just we can't balance around their skill level without basically cutting P2 out of the game. The game is already going to be full of tiny optional things for the player to grab and do: coins and power ups to collect, enemies to kill, stars and stamps to find. But just having those things for the player to do isn't the same as incentivising the player to push themselves to go after them. They will be drawn to simply helping their friend along -as they are right there with them- and as such not push themselves. The fact that a game could potentially be fun to play doesn't mean the game is actually fun to play. So how does Super Mario 3D World make the game more interesting for better players? It gives them a crown! A crown. Singular. 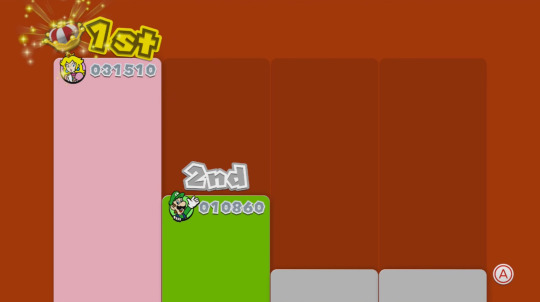 Up to 4 people and a single crown. At the end of each level the points each player got are tallied up and the player with the most points gets a crown. The player who wins the crown gets to wear it in the next level, and whoever finishes the level while wearing gets an extra 5,000 points. If you get hit while wearing the crown you drop it and it becomes a scramble to pick it up again as everyone goes after it. It is shiny, pointless, and I want it. Collecting Green Stars and the like are communal goals, so while there might be an incentive for the group to get them there is less incentive for each individual to want to personally go that extra mile. Make it a competition though -with status as the reward- and people will want to go after it. Yet because it is a cosmetic thing without game play implications it doesn't prevent people from cooperating. While effecting nothing, the crown changes everything. The goal is to give people something to do, while not overly pitting their interests against each other. 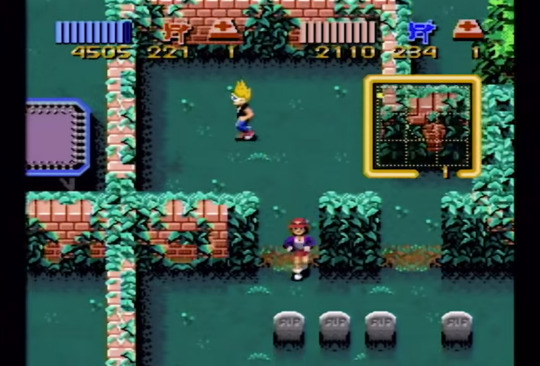 This isn't a new concept to games, Zombie's Ate My Neighbors on the SNES would track how many points each player got and give a run down at the end of the level. 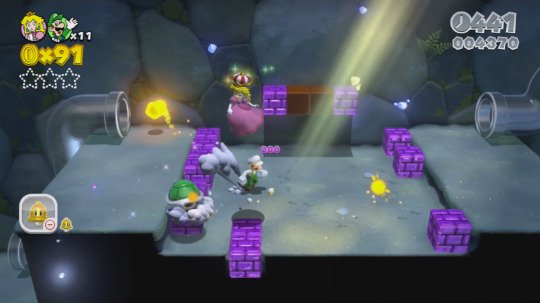 The addition of the crown just gives a more constant reminder of status and something else to fight over while making your way through the levels. When playing online with people anomalously this competition can turn sour pretty quickly though, even if it is for purely cosmetic things. For single screen games like Super Mario 3D World or Zombie's Ate My Neighbors -which are played with friends/family while sitting in the same room- it is great. By tracking and reporting how well people did as an individual you can encourage them to do better as an individual. It makes the tiny victories of getting a star or a stamp more meaningful and creates more player interaction because now player's aren't just playing along side of each other but competing over points. You become much more aware of other player's actions when those action could result in them getting points before you and so the game doesn't feel like you are all playing the game in parallel.